In the last article exploring solo improvisation, we found shapes around us to help us think of dance moves; shifted our weight in time with the beat to feel momentum and carry it into movements; and thought about what we can do to “look beautiful” while dancing. Let’s find more ways to bring solo improvisation into our dance lives. If you’re not ready to shake it in public, schedule a couple of hours to yourself and invite the spirit of inspiration to move you: dress up, put makeup on, do your hair, the whole thing. There’s nothing like “rehearsals” to get yourself together, even for a party. Besides, it’s fun, and you have to practice anyway! What about your dance space? I’ve always wished I could “prettify” the classroom where I teach, but it’s not practical to do so. We have a bare room and fluorescent lighting... not really inspiring, but at least we have mirrors and space. At home of course, I have a “spacious oasis” to dance in, decorated with all things vaguely Middle Eastern, mostly gifts I’ve received over the years. With soft lighting and incense I find it a much more enjoyable place to dance. Even if you only have one little corner of a room to dance in, you can make it special by decorating. Drape your veil on the wall, hang up your hip scarves, tribal belts or jewelry. Have a hafla - a belly dance party. Bonus points if everyone dresses up in sparkly belly dance gear! Now you and your guests can get your groove on to Arabic party music. Go to a drum circle, or host one yourself. Drum circle drummers are just into drumming and either don’t care, or would actually love it, if you danced to their drumming. No finger cymbals though! At times, everyone - no matter how long they’ve been dancing - feels like they do the same few steps over and over. In previous articles I gave tips on structures to use, like Pattern/Change, and Theme and Variation. Get a couple of index cards and write out one Theme & Variation to use until you’ve got it by heart. So You Want to Improvise? - Tips and Tricks to Get Your Started. 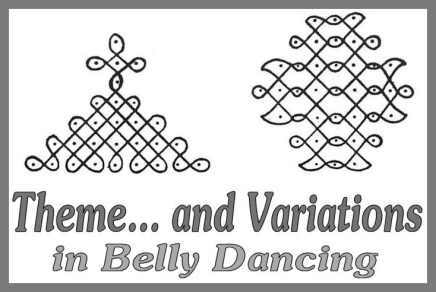 Once you try these concepts a couple of times you’ll always have them in your mental repertoire to draw from when you’re dancing without choreography. By the way, I find that involving a friend and then taking the journey into belly dance together can be a great source of comfort, inspiration, and growth. If you don’t have a practice and/or dance partner, reach out to a classmate, or even someone who’s not in class yet but who seems interested. Have them sign up for a trial session so they can join you for practice hour. Just make sure you both stay in class and resist the urge to drop out and “study” with DVDs. Most of the time, that has less than beneficial results, especially at the beginner level. Keep exploring, keep dancing, and enjoy the journey!